Diploma mill recipient Coach Drew Johansen, center, with two Olympic athletes. Drew Johansen coached the U.S. dive team to Olympic glory in 2012. He is the king of swim coaches, according to a press release issued by Indiana University via Swim World Magazine last month after IU lured Coach Johansen away from rival Duke University. Unfortunately, Johansen’s only degree, an online bachelor’s in PE, was awarded by Rochville University, the same diploma mill that awarded my dog a master’s degree based on a review of his exceptional resume in 2009. Last week, a tattletale article in the Indianapolis Star ignited an ugly battle on the issue of degree mills, educational integrity and shaky ethical standards inside academia. Read the Indy Star commentary and you’ll discover many believe that neither the degree mill swim coach nor IU did anything wrong. Give me a break. A degree is just a piece of paper. This guy is more than qualified to do what he was hired to do, which is coach diving, with or without that piece of paper. I, on the other hand, look at this story and see the proverbial tale of smart folks being soundly blinded by the lure of future Olympic gold. 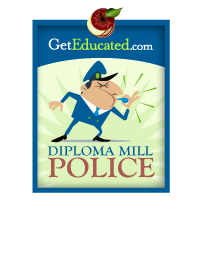 A network of diploma mills operating under the brand name of Belford suffered a financial blow after a federal court in Michigan mandated a $22.7 million payout to duped students who bought the group's fake GED diplomas and college degrees. Belford High School andBelford University—both owned by Pakistani businessman Salem Kureshi—lost a federal class-action lawsuit for selling scam credentials to students. Now the Belford gorup of schools must make financial amends to their duped alumni in what authorities have ruled a degree mill scam involving several Internet domains, all operating under the Belford tagline. On Aug. 31, 2012, U.S. District Judge Mark Goldsmith ordered Kureshi and his co-defendants to pay $22.7 million in a lawsuit settlement to Belford students in compensation for selling unaccredited diplomas and degrees. The Belford scam encompassed 30,500 plaintiffs living in the U.S. who purchased a fake diploma from Belford High School or Belford University from 2003 to 2009, at the start of the lawsuit. According to reports published in the University World News, the worst mass murderer in Norwegian history, Anders Behring Breivik,funded his killing sprees by operating a fake diploma and college credentials business online. The fake diplomas were hand-crafted in Asia to look as if they had been issued by Ivy League universities in the USA. Breivik, the notorious gunman who killed 77 innocent young campers on Utoya Island, Norway, admits to having netted over a million dollars by running a racket that cranked out fake diplomas online. The fraud catered largely to buyers from the United States. Brejvik sold a reported 200 fake diploma packets a month to Internet shoppers. Richard Hardin, a researcher for the Alabama Cooperative for Public Education (ACOPE), based in Mobile, Alabama, has authored an eye-opening report about degree mills and state college employment practices. The report, which appears in The American Reporter, alleges that several Alabama state college systems are knowingly being run by presidents or chief academic officers whose PhD degrees have been issued by scam degree mills that specialize in selling bogus life experience degrees. The University of Newcastle, an online college diploma mill that was recently closed in the UK, has opened a new website which cites operations in the United States: Chicago and Washington, D.C. Established in October of 2006 and operated out of a pub in Manchester, UK, this unaccredited university provided phony diplomas to 1,797 students—netting almost 2 million pounds (equivalent to a little over $3 million), according to a recent report in the London Times. Eight students who received these phony degrees have been arrested for alleged connections to Al-Qaeda, the Times reported. Over the last four years, the University of Newcastle claimed distance degree operations in Ireland, the UK, and the South Pacific. Facing prosecution in Britain, the degree mill recently moved its primary address to the U.S., citing Washington, D.C. as its chief center of operation. TV station WWLTV is reporting that Columbus University online of Louisiana, a non accredited online school, is the target of an FBI investigation for diploma mill fraud and the selling of fake diplomas online. The FBI alleges the school is being run from prison by former state Senator of Louisiana, Michael O'Keefe Sr., 78, who served in office for 24 years before being sentenced to federal prison for stealing from an insurance company, according to WWLTV. Watch WWLTV report about the FBI's investigation of Columbus University. We've all seen the spam. Makes no difference if you live in the urban United States or outer Australia. The "buy a degree" scam has gone global. "Degree mills and false credentialing are a serious problem worldwide, harming students, society and legitimate higher education." Fake online colleges that lure consumers in with the promise they can buy a degree online, fast and for a few hundred dollars, are thriving. 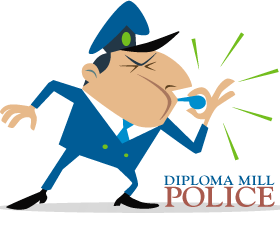 These diploma mills, often advertised as operating from headquarters in the U.S. while mailing credentials and diplomas from mail boxes overseas, represent a global problem that is being emboldened by several economic and social factors. Is online education as effective as face-to-face learning at the college level? Sixty-seven former students of Warren National University have filed a lawsuit in the Laramie County District Court in Wyoming claiming they were misled by the online university, reports the Associated Press. Many are now calling the online nonaccredited college a diploma or degree mill. Warren National, which was headquartered in Cheyenne, shuttered its virtual doors this spring after failing to achieve regional accreditation and having its license revoked by the state of Wyoming. As a result, former online students have been left holding worthless pieces of paper, questionable diplomas rather than the online degrees for which they paid thousands of dollars. The lawsuit states online students paid average annual tuition of $6,000 to $12,000, while Warren National University's owners took in $25 million to $30 million in tuition revenue each year. Warren National University, of Wyoming, announced in February that it will no longer accept online students. Warren National, originally known as Kennedy-Western University, began offering online degrees in the 1980s. The online college operated from California and Idaho before migrating to Wyoming in an effort to keep ahead of changing state laws on diploma mills. Colby Nolan, a black cat, brought new meaning to the term "educational pedigree" when, in 2004, he “earned” an MBA online from Trinity Southern University of Plano, Texas. Trinity awarded the cat a MBA degree based on a review of his work experience. The feline applied for his bachelor's in business online but a review by the Texas degree mill found that his work experience qualified him for an executive MBA degree. For a sum of $399, the cat was graduated with honors with a 3.5 GPA (that's a B-plus average) after Trinity Southern officials “evaluated” his resume—which apparently showed college-level business experience in the fast food industry, child care and, er, retail management. Colby’s diploma was purchased in a sting operation undertaken by the Pennsylvania Attorney General’s Office. Trinity was cited as a degree mill in the operation and ordered to pay restitution. The college had claimed operations out of Plano for years.